Talking to computers wasn’t a completely foreign concept when Stu and Heather Charles entered Red River College’s Computer Analyst Programmer (CAP) program in 1977. The CAP program, now Business Information Technology (BIT), had debuted in 1968, the same year 2001: A Space Odyssey introduced the HAL 9000 computer. But when Stu and Heather first met at RRC a decade later, programming languages like COBOL and Assembler were still mystifying to most people. Flash forward four decades and the Charles family is still ahead of the computer literacy curve, particularly since Stu and Heather’s daughter Nyssa Charles, 29, graduated in 2012 from BIT with a major in application development. Technology has advanced by leaps and bounds since CAP students wrote programs on punch cards that are considered vintage today. Stu, a 1979 grad, recalls that one assignment was infamous for how frequently students dropped their stacks of meticulously ordered cards. The evolution was already well underway in 1980. When Heather, a 1981 grad, returned to RRC after taking a year off to explore other career options, the punch card system had been replaced with brand-new Hewlett Packard computer terminals. She and Stu, who both retired in 2017, kept pace with developments over the ensuing years, through continuing education, professional development and personal research. The two-year CAP program gave them a solid foundation to build upon, and basic programming concepts still hold water — so much so that Heather was able to help Nyssa with a college programming assignment in the 2010s. Stu spent the last 17 years of his career as Chief Information Officer at the Workers Compensation Board, following a four-year stint as a consultant. His first job after graduating from RRC was at the Canadian Wheat Board, where he remained for 17 years. He has to chuckle when he recalls his first project, programming in TL1 (Transaction Language 1), which hadn’t been taught in CAP. “On Day 1, somebody hands me a manual and hands me a program and says, ‘Go learn it. Here’s an assignment,’” he says. Luckily, he soon realized that his programming skills were more than up to the task — in fact, they surpassed those of the Wheat Board employee who had been assigned to mentor him. Heather started her career in 1981 at what was then a small IT department at the University of Winnipeg. In 1982, she joined Manitoba Public Insurance (MPI) as a programmer and worked her way up to director of the application development area. She branched out into HR for a couple of years before becoming one of the first project managers at MPI. In 2011, she moved to Great-West Life as manager of the project management career centre, and in 2016 she brought her career full circle, managing the software developers career centre during her final year. The couple were involved with RRC throughout their careers, as co-op program employers and advocates, and as long-time members of advisory boards for CAP and the Information Systems Technology program, which was introduced in 1999 and merged with CAP to become BIT. Stu served for 25 years, including several years as chair of the CAP and BIT boards, while Heather was on the IST and BIT boards for nine years, serving as chair in 2009. Heather is not only a 2000 graduate of RRC’s Project Management program; she went on to teach Project Management Fundamentals and Case Analysis in the mid-2000s, and she developed two distance education programs in Project Leadership, which she’s been teaching since 2016. She and Nyssa have both appeared on RRC billboards — Heather in 2005 as part of the Going Places campaign and Nyssa in 2016, with the tagline Manitoba Hydro Hires Red River Grads. After studying Hotel and Restaurant Management at RRC, Nyssa worked in the industry for a couple of years before enrolling in the BIT program. “I was looking for something that had more Monday-to-Friday hours, more of an office environment,” she says. Having access to a home computer from the start, and hearing IT talk at the dinner table as she grew up, it didn’t take much of a leap for Nyssa to choose BIT. But her parents did remind her that IT pays well and provides the intellectual challenge she was seeking, as well as opportunities to follow a variety of career paths. And it didn’t hurt that they were able to share their own experience and expertise. Following an eight-month co-op placement at Manitoba Hydro, she worked at Hydro part-time during her final semester at RRC and has now been with the Crown corporation for six years. Working in an IT rotational program, she’s performed in several areas, and hopes to land in her current role, business analyst, full-time. 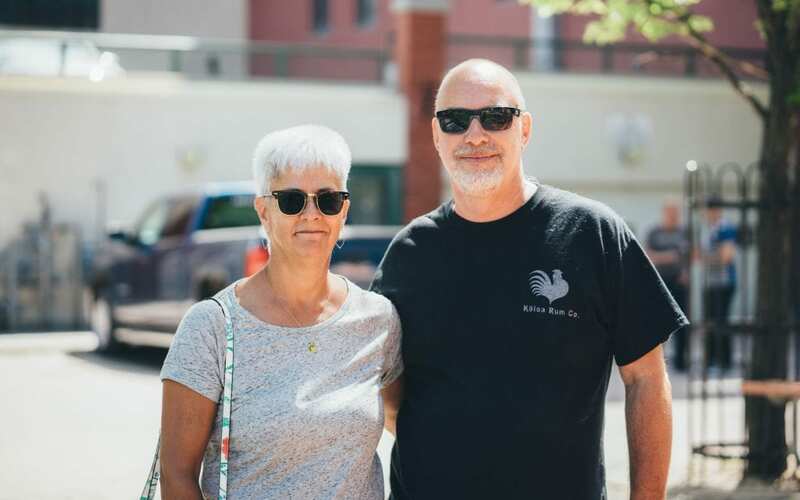 The Charles family and other grads were invited to celebrate at a block party at Old Market Square in early June, and they’ll have another chance to talk shop when RRC salutes the program with a 50th anniversary gala dinner on Nov. 3.